So, class, welcome to your first day of Cooking 101. Today’s lesson is sauces. First sauce, velouté. What is a velouté you ask? Well, don’t ask a Frenchman because they’re likely to laugh in your face, spit on you for your ignorance and then leave you without any pride or dignity (or answers either). Velouté is one of the four original French “Mutha Sauces”, along with Béchamel, Hollandaise and Espagnole and is created by combining a roux (flour and butter) along with stock (usually chicken or veal). Now, class, a second super-sauce that you all must know how to make is another one of the mother sauces, béchamel. Béchamel is the base of many other classic sauces including Sauce Mornay and the delectable cheddar cheese (AKA, Mac-n-Cheese) sauce. It has become like my buddy, friend and confidant over the past few years because it works with so much. It took some practice, but I now am able to make a great béchamel by eyeballing instead of having to annoyingly look at a Julia Child recipe. I really recommend you practice your béchamel-making too, class, as soon as you can. Class dismissed. I know I’m not breaking ground here with this recipe, but I decided to take the basics of the velouté and the béchamel and blend them to make what I am coining (please correct me if there is a traditional word) a velamel. This definitely isn’t as earth-shattering as the discovery Heather made with her tomato béchamel, but I tried. I knew I wanted a creamy pasta sauce but I didn’t have cream. Instead, I made a béchamel and then added some porcini broth/stock to create the pasta sauce. It was a fabulous sauce and perfectly thick without having that heavy-cream feel. Plus I was able to convince myself that it was less fattening. Now I’m sure some of your are thinking, porcini stock, wtf. I understand your pain. I wish there would come a time when we were able to buy fresh porcini’s as easily as we can buy brown mushrooms. But, until that day comes, I’m stuck using dried porcini’s. Besides utilizing the water used to rehydrate the porcini’s as part of the base for my ‘velamel’, I also pulled a Sandra Lee and used some of these great Porcini Stock Cubes by STAR. These cubes pack a punch and, I’m sure are filled with crap like MSG, but I don’t care. They worked really well with this dish. I don’t know how easy these stock cubes are to buy in the states, but I have found them for sale in an Italian specialty shop in Philadelphia, Manhattan and Brooklyn. You can also order the plain mushroom version here, but the porcini cubes seem to be difficult to purchase on the web. Please don’t hate on me for using these stock cubes. You could probably use vegetable stock or some veal stock to make this sauce. With some meaty mushrooms, you’ll enjoy this big bowl-o-pasta as much as I did. So try yourself some “velamel” next time you want a creamy pasta sauce.You’ll be glad you did. Combine milk and mushroom stock. In a separate pan (or even in a glass bowl), heat up your milk/stock mixture (feel free to heat up in the microwave for a few minutes until very hot). Meanwhile, in a new pan, melt your butter on medium-low until melted. Once melted, add the flour and stir until it’s all combined and smooth. Allow to cook together and continue to stir for about 5 minutes. Slowly add in the milk/stock mixture, starting with one cup. Using a whisk, stir constantly until the milk/stock mixture is absorbed into the flour/butter mixture. Turn the heat up to medium-high and add in some more of the milk/stock mixture, stirring all the way. Bring the mixture to a boil and then lower to medium and allow it to bubble away at a happy simmer. Cook on medium for about 10-15 minutes so it thickens up a bit. Add salt, pepper and nutmeg and taste to see if it needs any extra seasonings. Throw in the parmigiano reggiano and stir. The pasta looks great and your bechamel sauce sounds wonderful! Great recipe! A & J (your new handle)…I have shroom cubes (other brand), use them, love them and yes, pack a flavourful punch. I can see these were homemade pappardelle…Ummm – content now. No apologies necessary! I want some porcini cubes! Sauce and pasta looks fabulous, as always. Great winter dish. 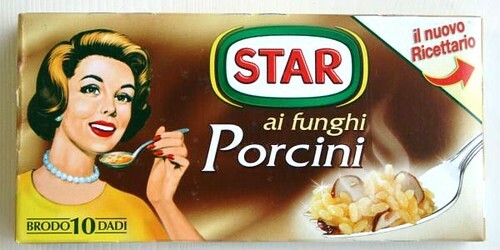 Love the 1950’s housewife on the MSG cubes of goodness! Oh my god this looks rich and luscious. 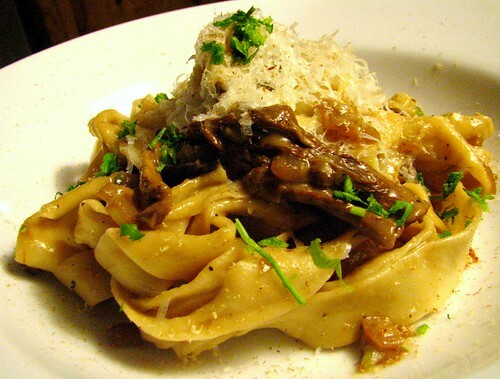 I totally love mushrooms in pasta but the recipes I have tried lately leave me wanting. This one looks soooo good! Looking so smooth, silky and mouth watering pasta. Delicious. I vote for Bachamute. I giggled all the way through the post with that title. I used to have those porcini cubes and I remember they packed a lot of flavor. Am gonna have to look for them again. Your pasta dish looks delicious. Love that this came out of what you didn’t have on hand. It’s a great, inspired technique. Oh my! This pasta looks so luxurious. I love your velamel sauce. I also love your pappardelle. I’ve got to track down some of those porcini cubes. If my Italian store can get guanciale, they must be able to get them too. I love dried porcini, it makes everything taste richer. This pasta looks great! 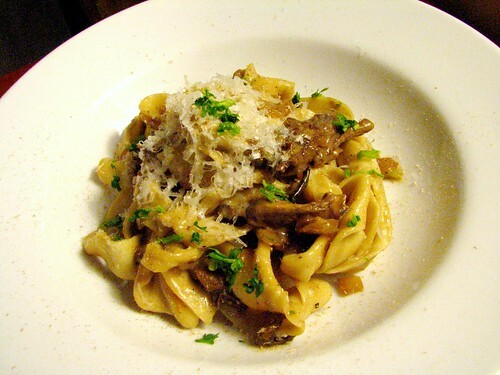 Pasta with mushrooms is my all-time favorite thing to eat. This meal would make me very happy. Ah, for porcinis to be as prevalent as creminis. . . I always have dried porcinis in our pantry and love to use them (No shame!). This looks way too good. And I happen to have some dried porcinis sitting in my spice drawer. I’d just call it “Chamel #5” and sell it in little bottles. I’m with peter on the name. The photo makes it all look silky smooth which is how I like a pasta porcini plateful. oh peter, you’re good. damn good. i’m going to patent.org and putting some money down for that idea! Is it just me or did you guys change your theme? Looks good! Sometimes those little cubes come in handy. I love this type of sauce because it is lighter and full of flavor. I bet it was good eating. what is not to love about ALL OF THAT??? i could eat a quart of that exact dish, happily. I adore porcinis. I think this is a great idea for a sauce, beschamel plus veloute, rich in flavor. Wow, that looks just amazing…yikes hunger pains. Well I love bechamel, and found out about veloute over the past year and loved it and mushrooms…. oh YES! This looks so very very satisfying. OK, you won’t catch me arguing with mushrooms… EVER. But, this dish is luring me in on SO many levels. Mushroom bechemel. My dear, you are my Hero! I had always heard that a mixture of velouté and béchamel was a sauce suprême, but looking it up just now, suprême is a chicken or veal velouté with (reduced) cream, and maybe mushroom stock, butter or egg yolks, depending on which authority you believe. So close, but not as simple as just mixing the two. I love the combination, though, and using mushroom stock is making me drool! I started laughing when I read the title of the post 😀 and no, I don’t hate you for using these foodie tips… we all do and it makes it easier. Lip smacking good thats for sure wow it looks amazing it lunch time now and looking at that has got my mouth watering. LOL. Velamel! That’s GREAT. This looks divine. I love bechamel and it’s nice to know it can be made just a little lighter with mushroom broth. Great posting! This looks absolutely delicious and so fun to make. I have to try it out! When you mentioned porcini stock I thought that it’s gonna be quite expensive. Nice to know it comes in cube form. They keep making me make fish veloute in class, and it keeps smelling like a French whorehouse. Bechamel, though, I can get behind. Is there anything it can’t do? Sorry but there are 5 mother sauces… Bechemel,veloute,tomato,espagnole and hollandaise. I wondered what a veloute with bechemel would be called? I also wondered a veloute with cheese wouldnt be a mornay/cheese sauce so is there a proper name?